Recently I attended the 8th Meeting of the Planetary Crater Consortium in Flagstaff, AZ. I presented my latest research in this fairly informal setting (questions from the audience are encouraged during presentations), and received some extremely valuable feedback. You can see the abstracts from the meeting here. Not familiar with JMARS? 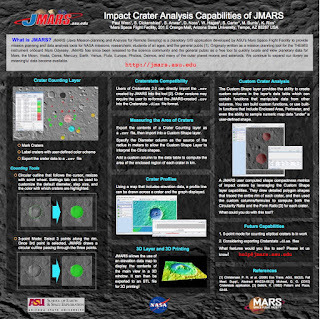 It is a free, open-source planetary GIS tool that can be downloaded from jmars.asu.edu! It suns on MacOS, Windows, and Linux.